If you're looking for my Inky Impressions post; please scroll down! I'm back to share that I'm A STEP SISTER this month for The Sisterhood of Crafters & our challenge for the next 2 weeks is Sentimental Journey-Make the sentiment your FOCUS! I found a great Irish verse on the web & used it to make my card...I must say that I LOVE how it came out!!!! Please go to our blog & check out what the rest of the Sisters created....while you're there; read up on our rules so you can play along with us! I can't wait to see what you all come up with! Have fun everyone & happy stamping!!! 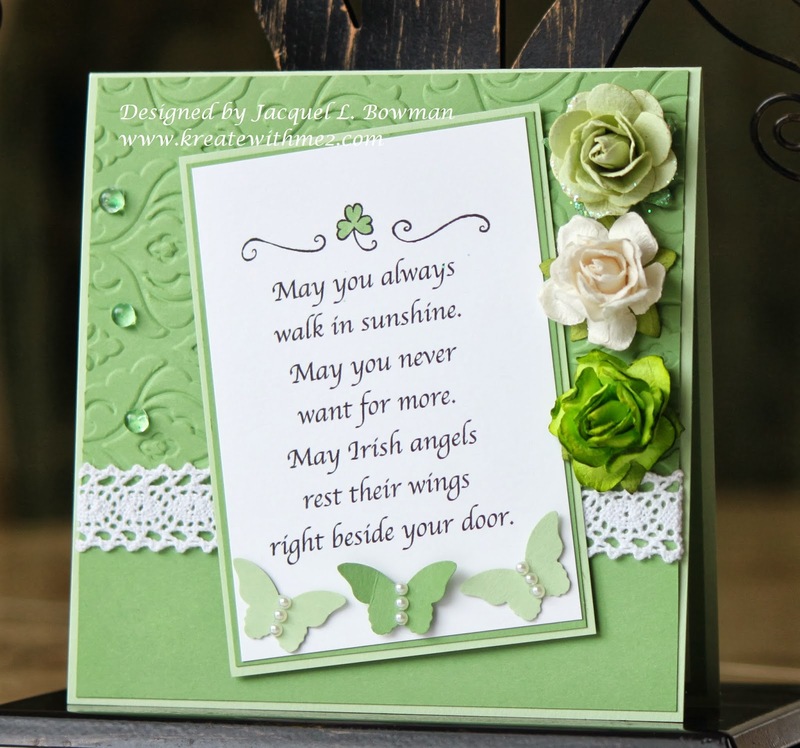 A beautiful card...LOVE the Irish blessing you have used, too...kind of partial to them!! 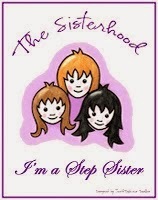 We love having you as one of our "step-sisters" this month at "The Sisterhood"....am looking forward to your next project!!! Oh Jackie your card is just gorgeous! LOVE the verse (hubby's family is Irish) the design & flowers ... PERFECT!! So happy to have you as our March Step Sister! Have a fabulous day! Ahhhh, beautiful! This is the kind of elegant card I associate with you, a true Jackie style type of card! And I love sentiment only cards, and this one is lovely! Well done!!! Great card, very pretty design and your little poem is lovely. Thank you for sharing your work with all of us at Crafty Boots Challenges. This is fantastic!! Love the dew drops and the flowers, the butterflies! Love the embossing!! The different shades of green are wonderful!! Thanks so much for playing along with us at Open-Minded Crafting Fun Challenges!!! Good Luck! I hope we see you again!! What a beautiful card! The sentiment is beautiful! So glad you were inspired by this week's Butterflies challenge at Cupcake Inspiration! This is such a great project, love the Irish quote and simplicity! Thank you for joining Glitter 'n Sparkle challenge. A great card, I love those words and your design is perfect to showcase them. Thanks for joining in at Crafty Boots Challenges this time. This is beautiful, Jackie!! Nice job with all the green! Your card is just beautiful! I just adore those pearl embellished butterflies! Thanks for joining us at Really Reasonable Ribbon for our "Show Us The Green" challenge. Our newest challenge starts tomorrow and I hope to see you there! What a fabulous way to frame this great sentiment! love the embossed background! Beautiful Irish Blessing card! Thanks for sharing it at Cupcake Inspirations this week! Loooove your Blog so much Candy to look at. This is such a Gorgeous Card Love it! Have a Great Weekend! Such an elegant card Jacquel and fabulous sentiment sweetie !! Thanks so much for playing at Crafty Sentiments Designs !! Congrats on being a step sister! I absolutely love this card. It is just gorgeous all over! Thanks for playing with us this week at Loves Rubberstamps! Congrat's! This is so beautiful, I love it. Thanks for playing with us over at Loves Rubberstamps!!! Your card is so fresh and I love your design! Thanks for sharing with us at Crafty Sentiments! I think this card is GORGEOUS! The flowers are great and the Irish Blessing is wonderful! Great Job! Hope to see you next month over at the Just For Fun challenge blog! New challenges start on the first of every month!